Photos Credits : Secretariat of Culture Mexico City. 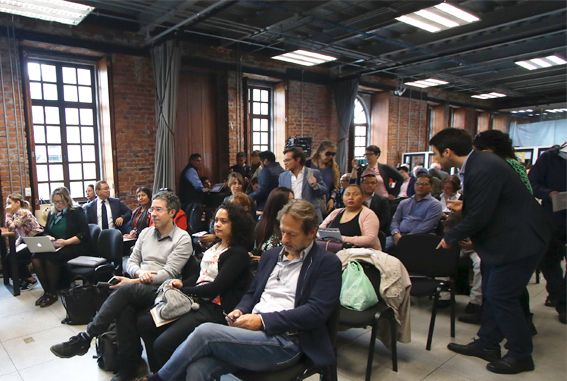 On 18 October 2018, the award ceremony of the 3rd edition of the International Award UCLG - Mexico City - Culture 21 took place. Co-organized by UCLG and Mexico City, this award recognises leading cities and individuals who have distinguished themselves through their work on culture and sustainable development. Following the announcement of the winners of the 3rd edition of the Award during the UCLG Executive Bureau in Strasbourg on 25 May 2018, and under the leadership of Mexico City in recognising local cultural policies as a pillar for making cities sustainable, the Secretary of Culture of Mexico City, Eduardo Vázquez Martín, together with the General Coordinator of International Affairs of Mexico City, Cuauhtémoc Cárdenas Solórzano, and the Coordinator of UCLG Committee on Culture, Jordi Pascual, gave the award to the four winners in person. The category 'City/Local or Regional Government', commended the candidacies of Lyon (France), represented by Loic Graber, Councillor on Culture of Lyon and its cultural policy "The sustainable city of Lyon and the fourth Charter of Cultural Cooperation", and Seongbuk (Seoul, Republic of Korea), represented by Kim Ji Hee, Co-President of the Seongbuk Artists' Round Table and Kwon Kyung-Woo, Director of Cultural Affairs of the Seongbuk Cultural Foundation, for the programme "Common Seongbuk Artist Roundtable’s local Culture Governance and Art Community Vitalization project". In the 'Individual' category, awards were delivered to Basma El Husseiny, Director of Action for Hope, based in Beirut, whose mission is to provide cultural support and cultural development programmes to communities in crisis; and to Patrice Meyer-Bisch, main promoter of the Fribourg Declaration on Cultural Rights, and President of the Observatory on Diversity and Cultural Rights, and of the UNESCO Chair in Human Rights and Democracy at the University of Fribourg. International Seminar on "Cultural Rights and Peace in the City"
In this context, an International Seminar on "Cultural Rights and Peace in the City" was also held on 19 and 20 October, co-organized by Mexico City and UCLG's Committee on Culture, with presentations from cities and local governments, cultural actors, academics and activists from all over the world. The 15th annual meeting of the Committee, attended by several cities and local governments, members of the Committee, as well as experts, academics and activists, also took place in the framework of the Seminar. These meetings were a special occasion to share ideas and experiences in various round tables on culture, heritage, public space, peace promotion, education, migration, citizenship building and right to the city. With the compilation of all the experiences and the commitment of stakeholders, the The Mexico City Declaration "Culture and Peace" was adopted by Mexico City and the UCLG Committee on culture on October 20, 2018. The Declaration can be signed through this link. The International Award UCLG - Mexico City - Culture 21 is a reference that proves how the UCLG Committee on Culture has become the main global platform on culture and sustainable development in recent years. United Cities and Local Governments (UCLG), has as a founding document the Agenda 21 for culture (2004), and works with cities around the world with the toolbox "Culture 21 Actions" to localize SDGs at the local and regional levels and achieve the implementation of global agendas at all levels. Read about the winners, and articles by Basma El Husseiny and Patrice Meyer-Bisch. Read information about the jury. Read all about the selection process. See the photos of the meetings on the Flickr of the Culture Commission.